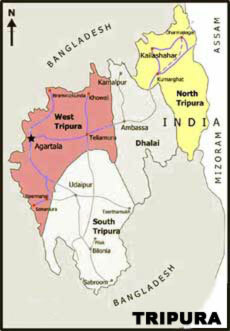 Tripura has a total area 10.492 Square Kilometres. The main reasons of poverty in the state are the high percentage of educated unemployed youth, surplus agricultural and jhumia labourers, inadequate scope for non-farming / non-agriculture based livelihoods and lack of primary and secondary employment opportunities. The crucial challenges are the weak infrastructure and lack of skills on the part of poverty-ridden people. Whereas the maximum numbers of people are engaged in agriculture sector, due to sparse irrigation coverage, a good part of cultivable land gives only single crop. Hence engagement of agriculture labourer round the year is uncertain. In addition, workers in small workshops, general shops, peddlers, vendors, etc. are living with acute financial hardships as there is no certainty of service and regular earning in the un-organized sector. The issue of the marginal farmers is another factor which has adversely affected the development process. Maximum poor farmers are having plots of the size of only 0.20 to 0.50 acres, the production from which rarely meets the annual food requirement of the household, thus resulting into overall food insecurity. Another vulnerable sector is the practice of jhum cultivation. The cultivators have not adopted the scientific jhum cultivation methods. Moreover, due to scarcity of dense forests, coupled with reduction in jhum cycle, the agricultural production has come down drastically. Most of the jhum cultivators are tribals with a semi-nomadic lifestyle. Apart from the central sponsored schemes like MGNERGA , SGRY, IAY etc, Government of Tripura has taken a new initiative called Peoples plan of Tripura with the objective to give a clear direction to policy formulation and planning process for all round development. Among other initiatives the State Government is giving emphasis on the tribal welfare plans having packages for education, economic infrastructure, socio-cultural development and health services. The three tier panchyati raj systems is very strong in Tripura and many development schemes specially MGNEREGA is implemented by it. Tripura is first among the states of India in utilization of MGNEREGA scheme essentially because of good functioning of panchayats. Within Tripura the less accessible tribal villages have higher relative poverty.